Unfortunately we don't actually have three hands, and it is quite difficult to get only one nail out from between our lips without letting them all fall out. Besides, nails taste bad. But we have all had those awkward moments. For those moments, a magnetic wristband comes in very handy. I've had mine for a couple of years, and it works very well to hold loose nails, screws, bolts, nuts, tacks or other small metal objects, while leaving your hands, and lips, free to do other things. 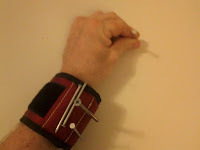 Its a simple idea really: a band, containing really strong magnets, that wraps around your wrist, closing with Velcro, thus giving you somewhere more convenient than your mouth for holding your nails and screws. I own the MagnoGrip 311-090 Magnetic Wristband (click the link to order from Amazon). The magnets firmly hold metal nails and screws of any size, since they are the very strong rare-Earth metal magnets, not the cheap and weak refrigerator type of magnet. The wristband material itself is a very durable ballistic polyester. This is a high-quality item, and one that I use often. I believe there are a few other brands available, but I have no experience with them and cannot vouch for their quality.